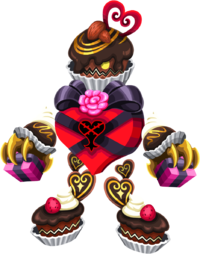 The Sinister Sweets is an Emblem Heartless that appears in Kingdom Hearts χ. It is weak to the Starlight Keyblade and serves as a raid boss. This page was last edited on 3 April 2019, at 18:46.